Looking for a new holiday tradition? 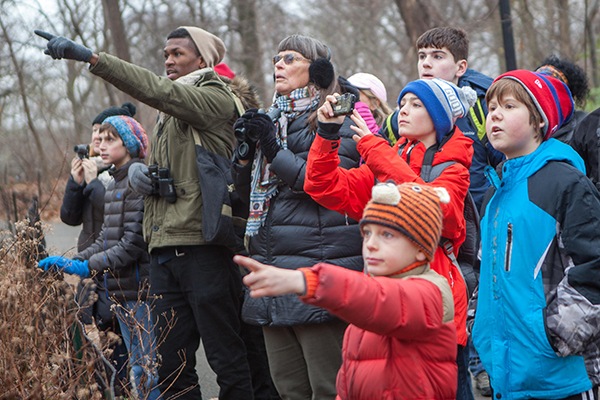 How about the national Audubon Christmas Bird Count? The Christmas Bird Count (CBC) will take place at the Montezuma Audubon Center located at 2295 State Route 89, Savannah, NY 13146 at 5:00 pm on Monday, December 19. This is a long-standing program of the National Audubon Society, with over 100 years of citizen science involvement. It is an early-winter bird census where thousands of volunteers across the US, Canada and many countries in the Western Hemisphere go out over a 24-hour period on one calendar day to count birds. As the Christmas Bird Count enters its 117th year, birders of all experience levels are encouraged to join us to count Montezuma’s wintering birds. The Montezuma Wetlands Complex is a globally significant Important Bird Area (IBA), contains numerous intriguing habitats: Lake, River, Deciduous Hardwoods, Open Field, Coniferous Stands, Fresh Water Marsh, and Grassland. The compilation will take place at the Montezuma Audubon Center located at 2295 State Route 89, Savannah, NY 13146 at 5:00 pm on Monday, December 19. Each count takes place in an established 15-mile wide diameter circle, and is organized by a count compiler. Count volunteers follow specified routes through a designated 15-mile (24-km) diameter circle, counting every bird they see or hear all day. It’s not just a species tally–all birds are counted all day, giving an indication of the total number of birds in the circle that day.